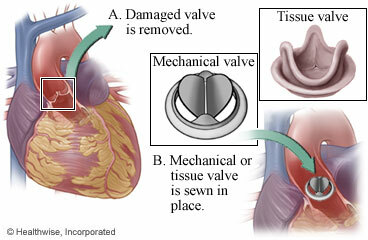 Aortic valve replacement gives you a new aortic heart valve. The new valve may be mechanical or made of animal tissue, often from a pig. Your doctor will talk with you before surgery about which type of valve is best for you. The aortic valve opens and closes to keep blood flowing in the proper direction through your heart. When the aortic valve does not close properly (aortic valve regurgitation) or is very tight and narrow (aortic valve stenosis), blood does not flow through the heart the right way. You will be asleep during the surgery. Your doctor will make a cut (incision) in the skin over your breastbone (sternum). Then the doctor will cut through your sternum to reach your heart. The doctor will connect you to a heart-lung bypass machine, which is used to add oxygen to your blood and move the blood through your body. This machine will allow the doctor to stop your heartbeat and replace the valve. After the doctor has replaced your aortic valve, he or she will restart your heartbeat. Then the doctor will use wire to put your sternum back together, and stitches or staples to close the incision. The wire will stay in your chest. The incision will leave a scar that may become less noticeable with time. You will stay in the hospital for 3 to 8 days after surgery. Enter J508 in the search box to learn more about "Aortic Valve Replacement: Before Your Surgery".